(Nanowerk News) Electroporation is a powerful technique in molecular biology. By using an electrical pulse to create a temporary nanopore in a cell membrane, researchers can deliver chemicals, drugs, and DNA directly into a single cell. 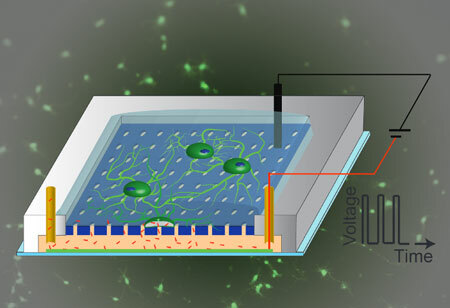 A Northwestern University collaboration has developed a novel microfluidic device that allows for electroporation of stem cells during differentiation, making it possible to deliver molecules during this pivotal time in a cell's life ("Microfluidic device for stem cell differentiation and localized electroporation of postmitotic neurons"). This provides the conditions needed to study primary cells, such as neurons, opening doors for exploration of the pathogenic mechanisms of neural diseases and potentially leading to new gene therapies. "The ability to deliver molecules into adherent cells without disrupting differentiation is needed for biotechnology researchers to advance both fundamental knowledge and the state-of-the-art in stem cell research," Espinosa said. "Non-destructive manipulation of cells over time and in the correct environment is a key enabling technology highly needed within the biology and medical research communities," Kessler said.